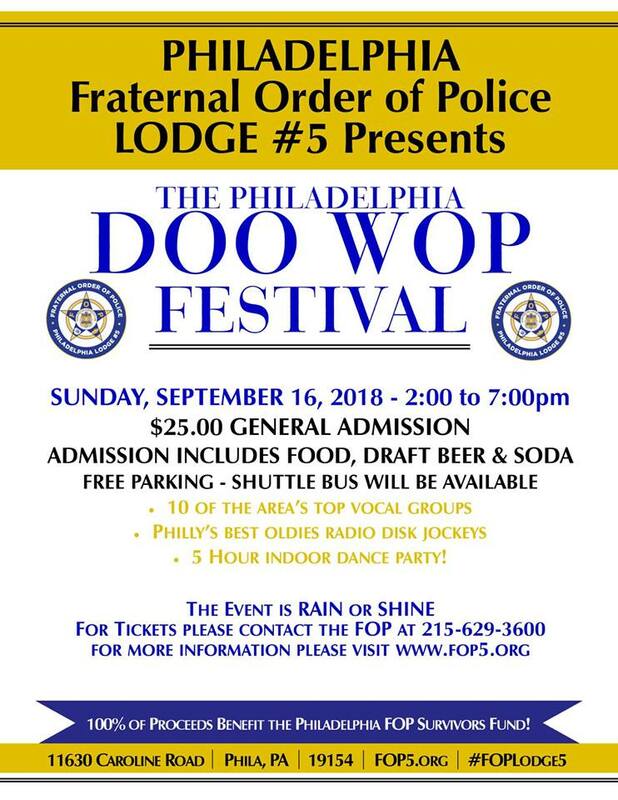 It’s almost time for the annual Philadelphia Doo Wop Festival at the FOP and it looks like another great time. The date is Sunday, September 16, 2018 from 2 – 6 PM and the location is again at the Philadelphia Fraternal Order of Police LODGE #5, 11630 Caroline Rd, Philadelphia PA. Admission is $25 at the gate or in advance and includes food, draft beer and soda as well as sets by 12 of the areas best doo wop vocal groups. There’s also an indoor 5-hour dance party and parking is free with a shuttle bus taking you from the parking lot to the festival. Event is rain or shine. 100% of the proceeds benefit the Philadelphia Police FOP Survivors Fund. Groups appearing at this year’s Philly Doo Wop Festival include Quiet Storm, Nostalgia 5, the Copians, Frankie & the Fashions, Grand Central Echoes, 5/3 Woodland, Blue Velvet, the Iggtones, Fogg, the Violations, the Belairs and Yesterday. For information call 215- 629-3600.